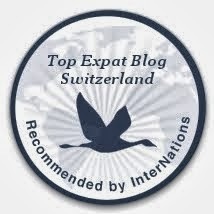 erniemcpeck - Adventures in Switzerland: Don't believe the hype! When I woke up this morning I was pleasantly surprised to see that the world had, in fact, not ended. There were no rivers of lava, no tsunamis, no crust-cracking earthquakes or freezing super-cells. No sign of an invasion by aliens bent on destroying the Earth, nor any scratches from collision with Planet X. Not one speck of ash from an Earth consumed by fire after the Sun going supernova, nor the blood-curdling sound of the final convulsive stages of people expiring from a deadly epidemic virus. No news broadcasts about Jesus' vengeful second coming, no fiery pits dropping straight into Hell itself. Not one single hoof-print from the Horsemen of the Apocalypse, and absolutely no fallout from global nuclear war. Instead, it was a morning like any other. Just like yesterday, and the day before that, and the day before that, and... well, you get my drift. It seems that the doomsday theorists have once again taken an otherwise ordinary day and hyped it out of all proportion. Instead of the much-vaunted global destruction, what actually happened on Friday 21st December 2012 was... nothing. Of course, it isn't the first time the Earth has survived "doomsday"; a quick read through the list of prophecies on Wikipedia shows just how often our destruction has - so far incorrectly - been predicted. 375-400 - Martin of Tours said that the Antichrist had already been born and would destroy the world before the year 400 AD, after finishing puberty. Apart from most likely causing a few parents to be a bit more suspicious of their kids, this didn't happen. Jan 1, 1000 - Christians said the Millennium Apocalypse would occur on this date, leading to the end of the world. Even the Pope joined the bandwagon. What happened? Some people rioted, some others made pilgrimages to Jerusalem. As for the Pope, when the world didn't end he then said it would really end in the year 1284 (conveniently after his death this time, no doubt to avoid further embarassment). Feb 1, 1524 - Various astrologers though a flood eminating from London would lead to the end of the world that year, which of course it didn't. I know it rains a lot in England, but I can't really see the Thames overflowing that much. Perhaps that's why the Thames Barrier was built in the 20th century - to keep floodwaters down and thus avoid doomsday. 1524-1526 - Thomas Müntzer said that 1525 would be the beginning of the Millennium, the start of Christ reigning for 1000 years before the end of the world. Although the world remained untouched, poor Thomas was tortured and beheaded for his predictions. 1656 - Christopher Columbus said in 1501 that the world would end in 1656. It didn't. He probably should have stuck to sailing and left doomsday prophesizing to others. 1853-1856 - Many people believed the Crimean War was actually the Battle of Armageddon. Grim though it may have been, with more than half a million people losing their lives, the Earth carried on regardless. Feb 4, 1962 - "Psychic" Jeane Dixon said that a planetary alignment on this date would bring about the end of the world. Nope. 1969 - Charles Manson said the world would end in an apocalyptic race war, which he attempted to start by ordering the killing of some people himself. His evil plan didn't work, and the world survived unscathed. Sep 6, Sep 29, Oct 2, 1994 - Harold Camping predicted the return of Jesus and the start of the Rapture. When nothing happened, he simply moved the date a few times. Mar 31, 1995 - Harold Camping had another stab at predicting the Rapture. Another failure. Jan 1, 2000 - Y2K bug predicted global computer crashes leading to major catastrophies worldwide. What actually happened was a few baby scans got mixed up, some slot machines in Delaware stopped working, and the Meteo France had a webpage showing an incorrect date. Inconvient, sure, but not exactly Armageddon. May 21, 2011 - That man Harold Camping at it again, supposedly the Rapture would begin on this date with some earthquakes thrown in for good measure and God taking 3% of the world's population into Heaven. Good old Harald said the world would end 5 months later on October 21. Oct 21, 2011 - Camping tried to explain his failed prediction from May that year by saying a "spiritual judgement" had occured and that the Rapture would still happen in October. Once again, he was wrong. May 19, 2013 - Ronald Weinland says Jesus Christ will return on this date causing the end of the world. I wouldn't get too worried though, as Ronald also said this would happen on September 29 2011 and again on May 27 2012. 2020 - Self-proclaimed psychic Jeane Dixon, following up on her wide-of-the-mark prediction from 1962, said that Armageddon would start in 2020, leading to a climactic battle between the returning Jesus Christ and Satan, the Antichrist and the False Prophet. Only another 7 years to wait to see if Jeane has more luck with this prediction than her previous one. 2021 - F. Kenton Beshore says Jesus will be back between 2018 and 2028, with the Rapture coming no later than 2021. Keep your eyes peeled for this one. 500,000,000 AD - James Kasting (a scientist who worked with NASA) calculated that a drop in the level of carbon dioxide will make it impossible for human life to be sustained on Earth. Although we will be long, long gone, let's hope our descendents have found other inhabitable planets and invented a way of travelling their by this date. 22,000,000,000 AD - Many scientists calculate that the universe will be torn apart through its own continual expansion (called the Big Rip theory). This is hypothetical, based on current knowledge of the universe, so I'm guessing the date might be somewhat approximate. If humanity survives to this date, I can't imagine people will be too critical of the predictions if the actual year it happens is 22,000,000,001, for example. 10 to the power 100 AD - The predicted Heat Death of the entire universe from the complete lack of thermodynamic free energy. Another date that might be a bit of a guess. So, if you want to pay attention to world-ending predictions, I'd put my money on the scientific ones. Actually, I wouldn't put my money on them - it's not like I'd be able to collect my winnings! We could, of course, get hit by a meteorite at some point in the future. Or some extremists could launch a nuke and start a global nuclear war. Or the ice caps could melt and flood the Earth. Or any other number of catastrophies might happen. But they aren't really something you could predict to an exact date. 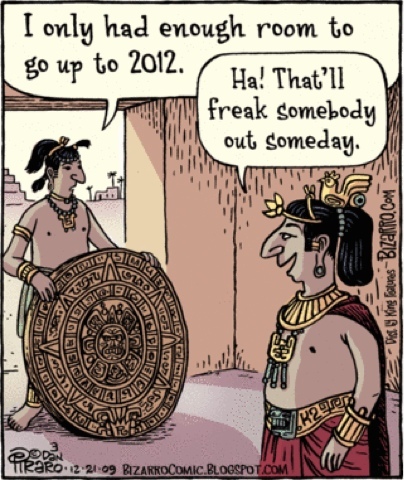 The moral is: don't waste time with doomsday theories and just enjoy your life!